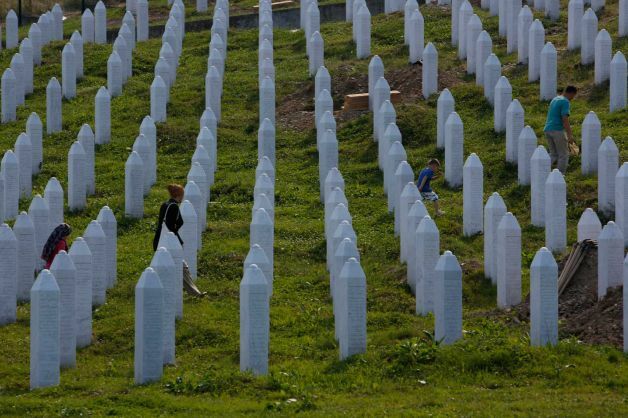 BELGRADE – Bosnians were defiant on Wednesday (July 8) as news broke that Russia had vetoed a United Nations Security Council resolution that would have condemned the Srebrenica massacre as a genocide to mark the 20th anniversary of the killing of 8,000 Muslim men and boys. China, Nigeria, Angola and Venezuela abstained and the remaining 10 council members voted in favour. The vote was delayed a day as Britain and the United States tried to persuade Russia not to veto the text, which would have also condemned denial of the 1995 massacre as a genocide. On the streets of Sarajevo, residents said despite the UN condemnation not passing, the world was already aware that the killings constituted genocide. “The whole world knows about Srebrenica. So all these resolutions drafted now, they do have some value, but the world knows that what happened there was genocide. Now, when will this genocide be recognised as such, or not… More time will have to pass, but in the end, it will have to be acknowledged,” one local, Dudo, said. “Bosniaks and normal people will keep saying it was genocide. And they will keep denying, those others, who keep on fighting against it. And that’s the way it is,” another Sarajevo resident, Enver Begovic, said. Earlier in the day at a commemorative peace march in Nezuk, Srebrenica mayor Camil Durakovic said whatever the UN vote, Srebrenica was still “de facto and de jure” recognised after the UN war crimes tribunal for the former Yugoslavia ruled the massacre, the worst mass killing on European soil since World War Two, was genocide. “We have reached a point where on the topic of Srebrenica, which is a de facto and de jure, a legal fact – not only morally and politically – we have reached a point where it becomes a test case for justice in this world,” Durakovic told Reuters at the yearly march, where thousands re-trace the route survivors took to reach safety after the town fell in July 1995. Serbia acknowledges that a “grave crime” took place and adopted a declaration condemning the massacre in 2010 as it sought closer ties with the West, but stopped short of describing it as genocide. For the executive director of Belgrade-based human rights NGO the Humanitarian Law Center, Sandra Orlovic, Russia’s blocking of the condemnation would be seen as a “step back” in relations between the two countries. “I think that Serbia and its officials – contrary to what we have been hearing in the past month about their determination to achieve reconciliation, to extend a hand to the Bosniak people, to turn towards the future, to recognise victims, and everything else we heard from our officials – they nevertheless did something completely contrary to that,” she added. The draft resolution angered Bosnian Serbs and Serbia, who branded it as “anti-Serb” and sent a letter of protest to the United Nations. Serbia warned on Tuesday (July 7) that the resolution would only widen ethnic divides in neighbouring Bosnia. In the Serbian capital, passers-by said they welcomed Russia’s veto. “Last night, [Serbian Prime Minister Aleksandar] Vucic said in a news conference that he was promised [a veto], not only by Russia, but also by China and some other countries, I think. So there, the Russians vetoed it. Great,” one resident, Mira, said. “Thank you to Russians, our brothers, for showing their support for us and for supporting us always. They showed that they are our true friends, always have been, and I am very happy about it,” another Belgrade resident, Dragan Begovic, said. Serbia’s President Tomislav Nikolic said in a statement on Wednesday that Russia had “prevented an attempt of smearing the entire Serbian nation as genocidal” and proven itself as a true and honest friend.